Six Sundays ago, I started a Sunday sunset yoga class, outdoors under this EPIC dome at my rock climbing gym Xero Gravity in Kuala Lumpur, Malaysia. Started out for friends, but the following week it was shared publicly and started catching on (thanks to those for the spreading the word!!). It was not only a great way to end the weekend and start a fresh week, but I found a new playground and playmates for me to style a new kind of yoga class. I continued to feel my way into integrating fun music with dance beats, have everyone share to build a community feel, adding in some partner yoga + acroyoga, and connecting people together on FB after. And, through building new playlists (thank you, Discover Spotify!! ), I continued to learn how music can dance with spontaneous sequencing of the class as we flowed from daylight, to sunset with fiercely orange clouds, to dusk, to darkness. After 4 incredibly fun Sundays, I am spending the next few abroad. A few days ago, I taught a class in Tamar Park, Admiralty, Hong Kong, just shared on FB the day before. Riding off the wave of a yoga teacher Adam Weirick (Yoga Union studio)’s giant pop up yoga class there, I continued my Sunday sunset outdoor yoga class series. With the harbor and Kowloon skyline on one side, and the backdrop of the HK Island mountains and epic, looming HK skyline on the other. It was an unreal location. 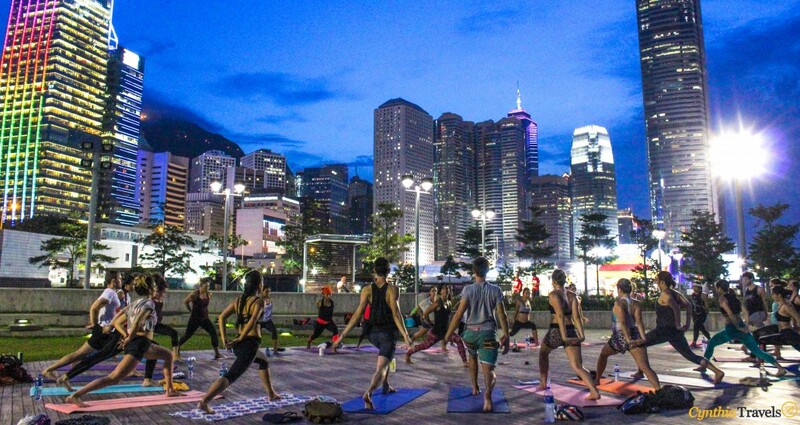 About 30 people came on a Sunday evening to yoga together, in the Culture Plaza of Tamar Park, Admiralty. As people came early, on time, and strolled in later, we widened the circle as we each introduced ourselves, where we’re from, something that scares us, and request a pose for the class (great idea, Natalie Fabien!). We had probably 10-15 nationalities there! Appropriately named, Culture Plaza 🙂 Big shoutouts to Marcel Erasmus for doing a handstand workshop after the class, and Adam for assisting and sharing with your students! And thanks to my friend Emily for noticing this awesome coincidence – the “All of the Lights” Kanye song came on during the nightly HK lights show!! (This song is a tribute to when it came on during the last ladies nights with some of my yoga teacher sisters 😉 In tying in the final yoga poses requested, I unfortunately had everyone facing down during this song, softening and melting into their pigeon hip opening stretches. But still, “All of the Lights” came on during the lights show!! When the primarily instrumental “Stars” song came on while winding down, we inhaled, looked up as we raised our hands to the sky, I mentioned that the first person who saw a star in the sky, will get a …star! I actually paused since I was drawing a blank and almost said ‘recognition’ (lol I just say whatever pops to mind anyways). But anyways, what do you get you spot a star? A pat on the back? Nope, people don’t care. Inner gratification? That’s true, but why does it seem like not enough at first? How much do we wight inner satisfaction vs outer validation when we achieve something? Unfortunately it’s Hong Kong, and you can’t see stars when you’re in the city. So I couldn’t spot a star later as the buildings, lights, and moon were super bright. But I later realized, whatever in truth exists, will always be there anyways. Plus we have so many senses and ways of “seeing” and “feeling”. If you see it – if you feel what exists – then it’s yours. If it seems hard, use a different perspective, a new vantage point. Because, it is always there. Slow it down. Seeing, feeling the stillness in the shadows of our day and our mind, allows us to finally connect and begin to listen. Honor your city, your environment. Honor the chaos. Honor your chaos, your efforts. Recognize the light in you, become friends with this light. Only then, can you truly begin to see the light in others. Find what fuels your flame, live there. Keep feeding your flame. Allow it to shine, make it a habit. You’ll continue to surprise yourself how bright it can shine. Strive to be the light for others. Be the light, be the love, be the luck for others. And I promise, your light will shine brighter than you ever could’ve imagined. We are as expansive as our hearts and minds allow us to be. Let it all go. Learn to surrender. And when they strike, we light up the worlddddd.